Full Fee $2187.00 incl GST - Best Value! Save by enrolling in four of your favorite Zoo Keeping and Wildlife Courses. Studying online courses in Zoo Keeping is an excellent idea for anyone wanting to get into zoo keeping or to build on your existing knowledge and skills. 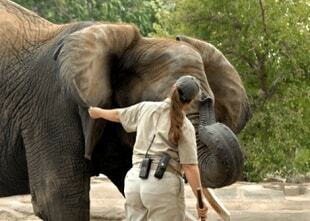 This online course is designed for students who want to learn a wide range of skills and knowledge about Zoo Keeping. This course covers not only zoo keeping, but also animal behaviour, and animal health care. Students may choose one elective from the following modules: Primatology, Herpetology, Ornithology, Vertebrate Zoology, Marine Studies A (Or Aquarium Management), Wildlife Mgt or Diagnosing Animal Diseases. Careerline’s course in Zoo Keeping will introduce you to the various aspects of working in zoological gardens and safari parks and general captive animal management. You will learn about Animal Welfare, Animal Care, Diet and Nutrition, Forms of Enrichment to enhance well-being, Captive Breeding, Enclosure Design, Research, Education and Conservation in Zoos. The study of animal behaviour (ethology) is considered important to the practice of training animals by consideration of their natural behaviours that may be suitable for specific tasks. Additionally, understanding animal behaviour contributes to animal training by means of understanding how to encourage desirable natural behaviours and discourage those that are undesirable. Understand why animals behave the way they do. Learn to understand difficult behavior and techniques to deal with it. This is a very useful qualification for anyone working with animals or for someone wishing to set up their own business. Learn about the different influences on animal behavior such as genetics, biology and more. Careerline’s Animal Behavior course is suitable for anyone interested or working with animals, trainers, pet carers, zoo keepers and more.